We’re in the middle of the conference finals right now, and it’s looking like Pittsburgh is beginning to stake their claim to this year’s championship. The Penguins and the Tampa Bay Lightning are in a heated conference final while the St. Louis Blues and San Jose Sharks are deadlocked in their own series as of this writing. But it’s the fast-paced style of the Penguins that has made them the most exciting team to watch since the playoffs began. The Penguins have been a downright revelation since the post-season started and are riding high on a huge wave of momentum after downing a hyper-talented Washington Capitals team in the second round. If Pittsburgh can continue to perform at this level, they very well might be on their way to their fifth Stanley Cup Final in franchise history. 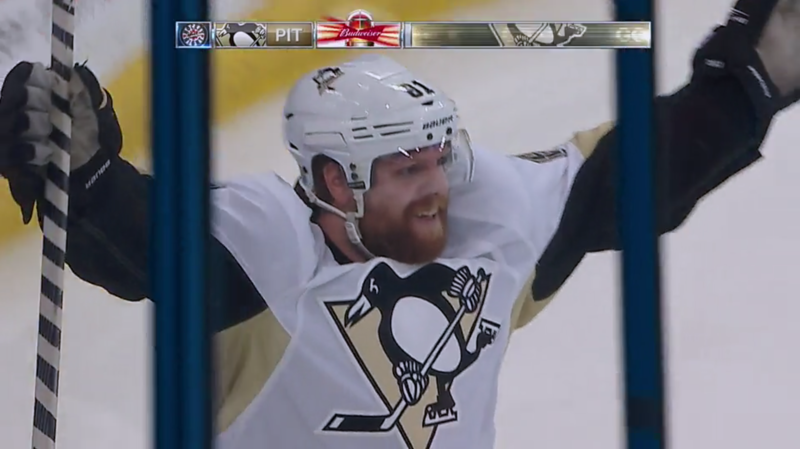 Much of the team’s success has to be attributed to the Penguins’ dominant “HBK” line. The trio of Carl Hagelin, Phil Kessel, and Nick Bonino has been unstoppable to the point of receiving their own awesome nickname based on the last names of the players. Naturally, HBK is also a riff off of the classic moniker of WWE superstar Shawn “The Heartbreak Kid” Michaels. The HBK line has become an absolute juggernaut since being assembled, scoring consistently during the last 29 games with Hagelin putting up 24 points while Bonino and Kessel have notched 28 and 30 of their own, respectively. In Game 3, all three members came to play with Hagelin putting up his fifth goal since the playoffs began, an assist from Bonino, and an additional goal and assist from Kessel to lead to a convincing Pittsburgh win as they took control of the series, 2-1. It should be noted that none of these players were on last season’s team and that this addition is largely to thank for the Penguins’ return to power. Combine the HBK line with Sidney Crosby finding his stride as an offensive player (scoring twice in the last two games after going goalless for eight), and the team’s dominance shouldn’t be a surprise. There’s so much offensive talent on Pittsburgh that they’re next to unstoppable once they get going. The Penguins were originally the second most-backed team to win the Cup, and the other teams from the top five (Washington, Dallas, Chicago, and Anaheim) have all been knocked out of the playoffs. Considering the way that Pittsburgh has been playing, we have a hard time seeing anyone left giving the Penguins a run for their money. The Penguins already stopped the Capitals cold in their tracks in a series that had the feel (and quality) of a Stanley Cup Final more than anything we’ve seen so far this post-season. Washington was arguably the most talented team in the league and finished first in the regular season. Now that Pittsburgh has them out of the way, the Cup should be theirs for the taking and we can’t see anyone standing in their way.